When I first stumbled across bareMinerals a couple of years ago, I will admit to it being a brand which I found myself a little bit nervous of. The reason for this being purely down to the concept of a mineral foundation, it was just something which I had never even considered, let alone put on my face. Over the last year I have dabbled in mineral make up here and there and have been pleasantly surprised with the results, although I am still yet to try the mineral foundation. 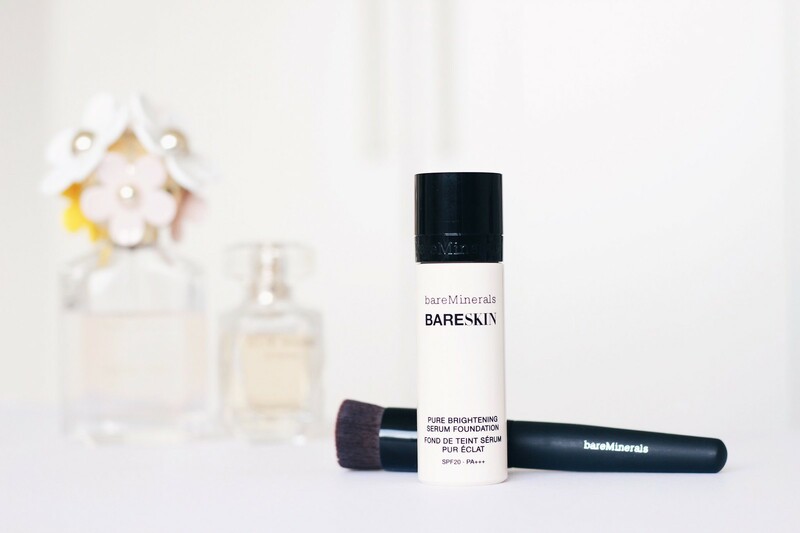 Whilst bareMinerals is most certainly based around mineral make up, I think it is worth noting that they are expanding their range and indeed formulas which have incorporated two recent bases which I have enjoyed quite a lot. Earlier on this year I purchased the bareMinerals Complexion Rescue which is a rather light weight tinted gel cream. It has a lovely airy texture with a beautiful finish, however if I am honest I think that I picked it up at the wrong time of year. The coverage is fairly light, in fact it is a bit too light for me at the moment therefore I know I will find myself reaching for this more during the summer months as opposed to the beginning of the year. That being said, what with this new liquid/gel based formula being released from bareMinerals it has since paved the way for the Bareskin Pure Brightening Serum Foundation* which I have being road testing for the last four weeks. 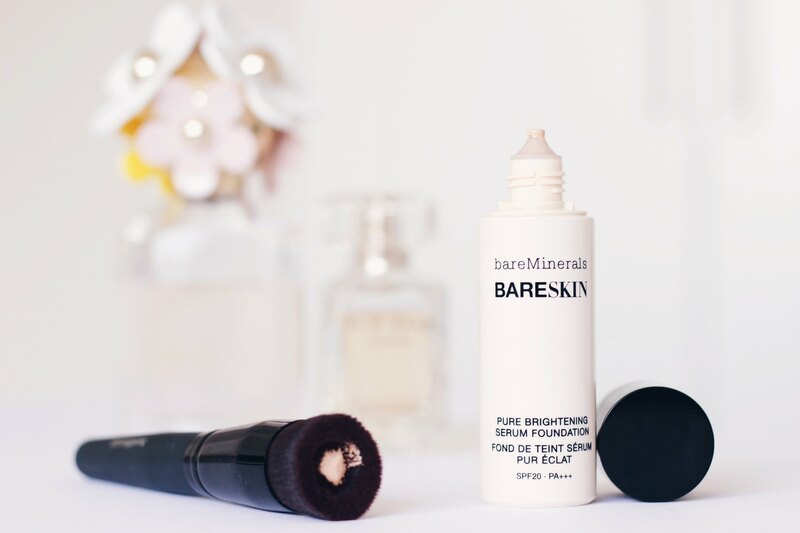 The Bareskin Pure Brightening Serum Foundation retails at £26 which I think puts it on an average playing field when it comes to higher end foundations. Available in twenty different shades it offers, once shaken and most certainly not stirred, an extremely light and easy to blend formula which provides medium coverage. One of the first things which first impressed me with this foundation was how silky smooth and light it felt on the skin. In truth there has only been one other foundation I have used which has felt as light as this, however it did not provide half as much coverage as this does. It is extremely important that you remember to shake this foundation before use or else you will quickly end up with a very watery liquid instead of the expected foundation. In terms of packaging I think it works relatively well, it’s clean and hygienic, however it can be a bit difficult to squeeze the product out sometimes. Having said that when it has been shaken it can easily overflow out of the nib so that is something to be mindful of. In terms of application I find that this works well, however this has only been after a bit of trial and error on my part. I was kindly provided with the bareMinerals Perfecting Face Brush* which I was extremely curious about due to the fact that it has a cut out circular well within the brush. This is essentially for the foundation to be placed into so that it can be buffed into the skin. On the face of it (no pun intended), the concept of this sounds and looks pretty good, however in practice, at least for me it did not work. The brush for me felt a bit too stiff as I simply could not work the product nicely into my skin with this brush alone. Whenever using this brush I would find myself reaching for another so that I could achieve a more flawless finish as I was often left with brush marks through the foundation on my skin. I think it is important to state here that this, I believe was down to the brush and not the foundation because with the other brushes I have used the product has blended much better. From reading a lot of opinions online about this foundation and of course using it for myself I have come to the conclusion that you need to build this up. It is very easy to use too much of the product which then can make the task of blending it out much more difficult, you will quickly become caked up in foundation which is not ideal. Only a small amount of product is required as a little really does go quite a long way. The shade I use is Bare Porcelain which is a very good match for my skin tone, it’s relatively yellow toned so those with a pink undertone may struggle, however I still think it would be worth trying a sample from your local counter just to be sure. My skin type is oily to combination with dehydrated areas in places. This can often make finding a foundation which works across all these different areas quite a challenge. Overall I would say that this does work quite well for me, however I think if my skin was slightly more oily then I would struggle as the texture has quite a bit of slip to it. There is for me only one main issue I have with this foundation and that is when I am wearing my glasses. I find that when I do the foundation easily rubs off very quickly around my nose, even when I have used a setting powder. This is something I do bear in mind as I wear my glasses pretty much around the clock these days so at the moment it is not a foundation I can wear to work, at least not until I find a really heavy duty setting powder. Despite the poor experience with the brush and the one issue I have when it comes to wearing this foundation and my glasses, I have to say that overall I really do like this foundation. It is super lightweight and it feels extremely soft and smooth on the skin. The finish is very natural and fresh and the formula contains SPF 20 which is important for protecting your skin against sun damage, no matter what time of the year. Despite the poor experience with the brush and the one issue I have when it comes to wearing this foundation and my glasses, I have to say that overall I really do like this foundation. It is super light weight and feels extremely soft and smooth on the skin. The finish is very natural and fresh and the formula contains SPF 20 which is important for protecting your skin against sun damage. The Bareskin Pure Brightening Serum Foundation* is currently available at Debenhams where they are currently celebrating foundation week with 10% off some of their most popular foundations. Offering my services…no not that kind!